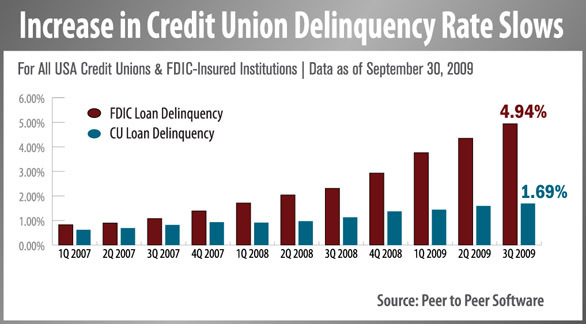 Several factors indicate that asset quality in the credit union loan portfolio may be stabilizing. Although the delinquency rate rose 10 basis points from second quarter results to 1.69 percent, net charge-offs rose only 1 basis point and the provision for loan loss expense declined from second quarter levels. All three measures posted smaller increases in the third quarter than in the second quarter. Some categories, such as indirect loan delinquency and charge-off rates for indirect loans and credit cards, improved quarter over quarter.